When it comes to holiday cookies, I’m game for anything — thumbprints with yummy jam, spicy gingerbread, buttery shortbread, those little cookies with red or green cherries in the middle, cut out shapes covered in colored sugar — I love to bake ‘em AND eat ‘em. But there’s another cookie I especially love. Biscotti! These twice-baked cookies are a real treat but, for some reason, I don’t even think to make them any other time of the year. Why is that? Certainly, biscotti is good on a year-round basis (gosh, you see them in every Starbuck’s, right?). And who doesn’t like to dunk one into a hot cup of coffee or tea? Or nibble all those crunchy, hard edges, hoping to get a toasted nut? I may need to address my quandary further but, for now, let’s move on. 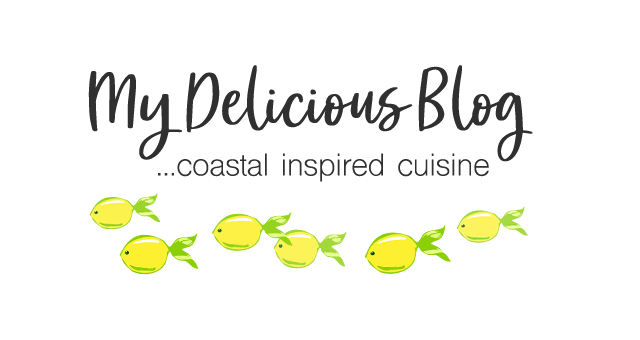 . .
My current, go-to recipe is the one I spotted in the New York Times Magazine many years ago titled “Bravo, Biscotti’ by Sheryl Julian and Julie Rosenfeld. Each year I carefully unfold my torn-out page, put the recipe into action, then delicately place it back into my recipe box when the season is over (you know it’s a good recipe when it’s been folded a million times, is full of stains and is dog-eared). It’s called “Corby Kummer’s Unbeatable Biscotti” and in the article the authors note their love of Mr. Kummer’s crunchy cookies, which he himself wrote about in The Atlantic years earlier (I think his article might date back to 2005?). The story goes that Mr. Kummer (a food writer) had traveled to Italy, where he tasted a most exquisite cookie, one that he decided to re-create at home. Apparently he went through about 18 batches before arriving at this formula — one that yields a crunchy cookie but doesn’t use any fat (the flavor and fat actually comes from the roasted almonds and the eggs). It’s a style of biscotti that originates from Prato, a wool-manufacturing town near Florence, where they’ve been making these heavenly cookies since the 14th century. 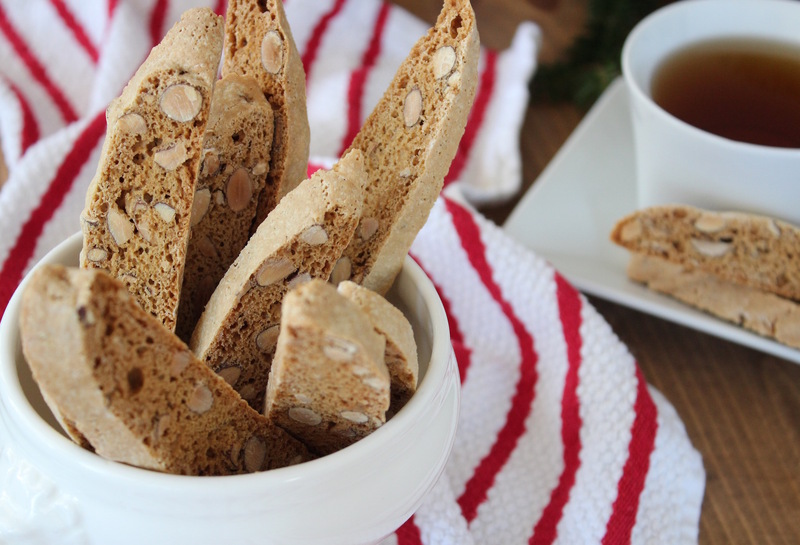 I like my biscotti crunchy and flavorful, so this one’s a winner in my book. Place almonds on a baking sheet and toast 8-10 minutes or until they begin to perfume the kitchen; remove from oven and cool. Reduce oven to 300 degrees and line a baking sheet with parchment paper or foil. In the bowl of a mixer fitted with a paddle attachment, place flour, sugar, baking soda and salt. In a separate bowl, beat eggs and vanilla; set aside. Blend dry ingredients on low speed, then pour in egg mixture; the dough starts to form after a minute or two, but will be sticky. 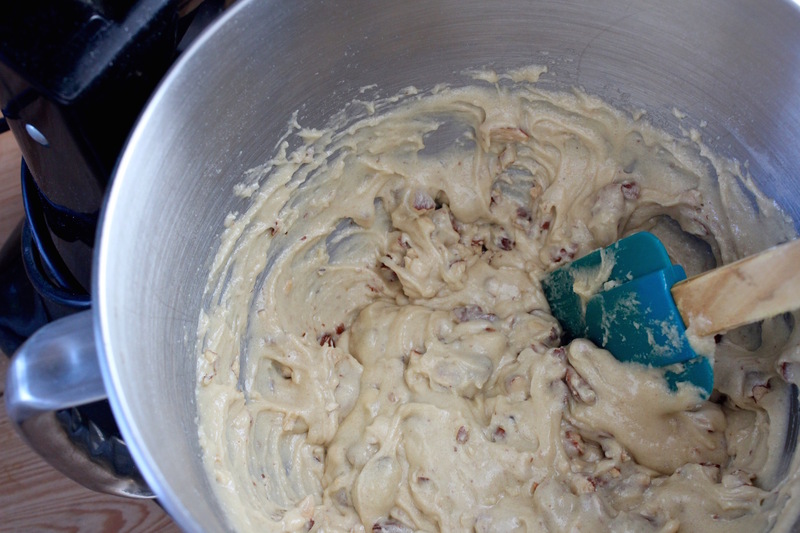 Add nuts and mix until they start to break up (keep your mixture in the locked position because this is a sturdy task!). Turn the dough onto a well-floured surface then use a pastry scraper (or your hands) to fold the dough over itself 3-4 times to distribute the nuts. Add a little bit more flour if it’s still too sticky. 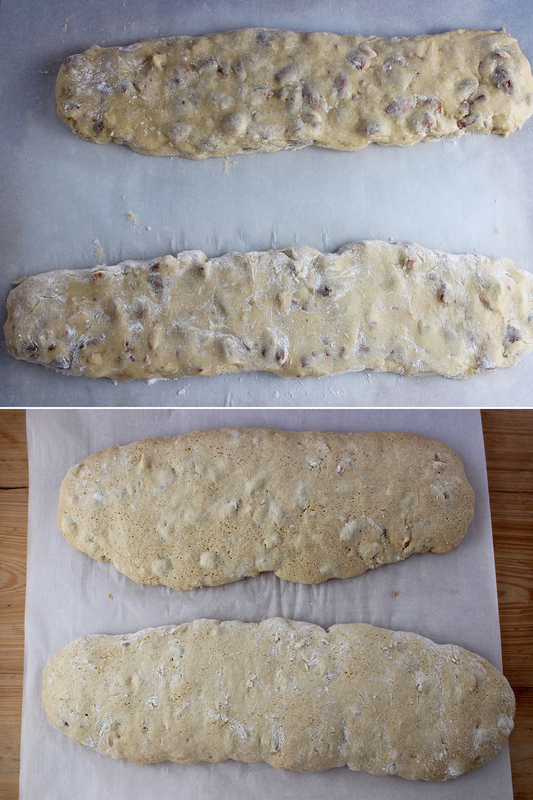 Let dough rest for a minute then divide into two equal parts. 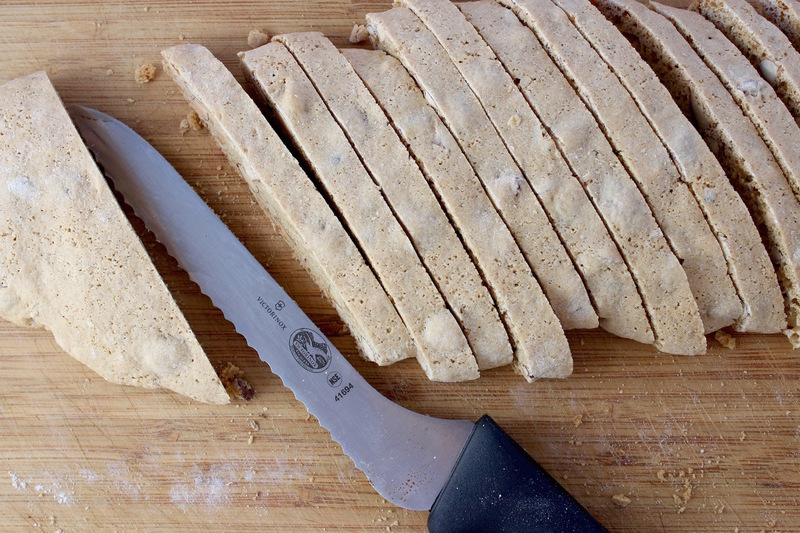 With lightly floured hands, elongate each piece into a strip 2-3” wide, 12” long. Transfer each to the baking sheet, leaving 4” between them. 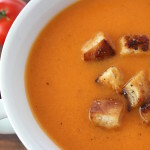 Bake 45-50 minutes or until they are slightly browned; remove and cool on baking sheet 5 minutes. Carefully transfer each strip to a cutting board. 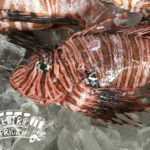 Using a sharp, serrated knife, cut the strips on a diagonal into ½" slices. Place slices on the baking sheets (you’ll need 2 sheets, total). Return sheets to the oven and bake about 35 minutes. Store in a container that allows air to escape, which will keep them from softening. They were delicious. 🙂 Thank you! I have been fortunate enough to have tasted your almond biscotti. It is the perfect Christmas cookie! I may even try making a batch this year. I’ve always wondered why people only make these around the holidays and not all year round. Biscottis go great with a cup of tea or coffee and keeping them in a tin of some sort will have them last for months. 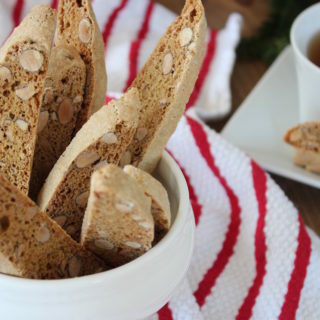 Nicole your almond biscotti look delicious. So I’m not the only one wondering about biscotti?!? Thanks for sharing my love of these crunchy treats, Joe. Happy Holidays! Joe is right, biscotti can and should be made all year long! 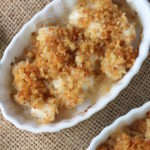 These were another one of my step-grandmother’s specialties (in addition to jam thumbprints and pizelles). She always added a little anise seed which was an acquired taste for me, but now I crave them with it. 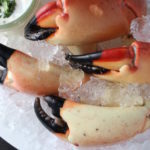 Love the idea of orange zest for a little homegrown Florida flavor. Wish I was there for the wine and burned cookie night! HA! 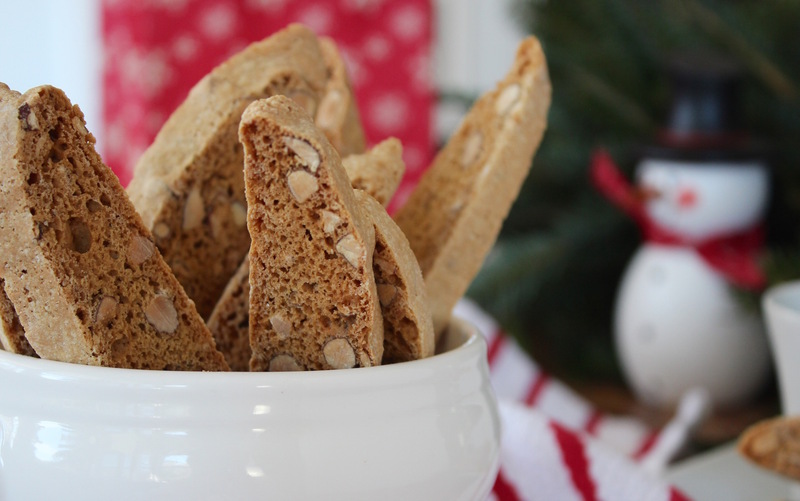 It seems many of us agree that biscotti should be a year-round cookie 🙂 I do love anise in my cookies, too, so I might try some in my next batch. 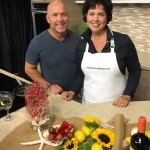 My friend Karen and I still talk about that ‘biscotti disaster’ night, but we still managed to have fun. Happy Holidays!